The Gorilla Organization is pleased to announce Ernest Fotsing as the winner of the 2018 Ymke Warren Gorilla Memorial Conservation Award. 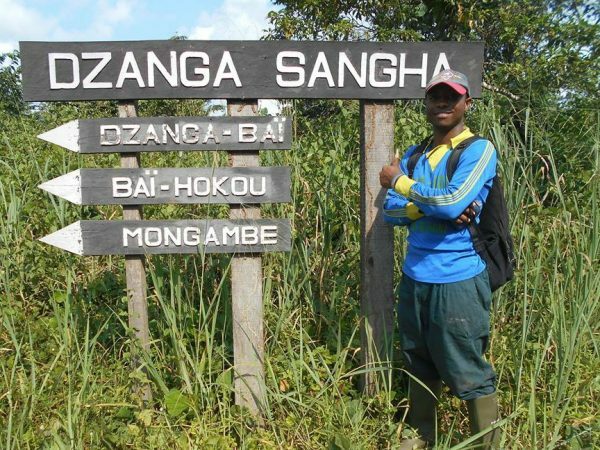 A postgraduate student at the University of Dschang in Cameroon, Ernest is working on a PhD research project entitled “Behavioural Ecology in a western lowland gorilla group under habituation to human presence for ecotourism in Campo’o Ma’an National Park.” The £750 award from the Gorilla Organization will help him carry out fieldwork over the next year. The research will be used to help Cameroon’s wildlife authorities better monitor and protect the country’s critically-endangered western lowland gorillas. Ernest’s main interest lies in the feeding and nesting habits of western lowland gorillas within their home range in the Campo’o Ma’an National Park. As well as recording nesting sites, his PhD research also analyses the diet of the gorillas, looking at how their feeding habits vary as they come into closer contact with humans. Ernest is currently collecting data on the density and distribution of the plants and trees the gorillas eat and use to make their nests. Alongside this, he is collecting data on human activity in and around the gorilla habitat in order to get see how increasing human-gorilla interactions are affecting the great apes. The Ymke Warren Memorial Gorilla Conservation Award was established to fund promising young African primatologists such as Ernest Fotsing. The fund supports fieldwork that contributes to our understanding of and/or conservation of wild gorillas and other great apes. It was set up to honour the work of Ymke Warren, a renowned British conservationist who was tragically murdered whilst undertaking fieldwork in Cameroon in 2013. Applications are now being accepted for the 2019 award. To find out more about the award and how you can apply, contact leo@gorillas.org for further details.